SAN SALVADOR – Governor Gavin Newsom spent the past 72 hours in El Salvador examining the conditions leading tens of thousands of families to flee their homes in Central America. Throughout his visit, the Governor discussed regional challenges and economic opportunities with officials including President of El Salvador President Salvador Sánchez Cerén, President-elect Nayib Bukele and U.S. Ambassador to El Salvador Jean Manes. He spoke directly to individuals impacted by gender violence, impunity and poverty – from women to children to youth seeking 21st century job skills as a way to bypass gang involvement. In response, the Governor announced action to bolster immigration relief, through family reunification services and holistic legal representation for immigrants and asylum seekers in California. The Governor also announced his support for H.R. 6, the Dream and Promise Act, which provides an opportunity for permanent status and a pathway to citizenship for Dreamers, Temporary Permanent Status (TPS) holders and Deferred Enforced Departure (DED) recipients. Governor Gavin Newsom hears from at-risk youth participating in a USAID coding class whose funding is being threatened by the Trump Administration’s cut to Central American aid. Photo credit: Eduardo Ezequiel. Governor Gavin Newsom meets President-elect of El Salvador Nayib Bukele. Photo credit: Eduardo Ezequiel. 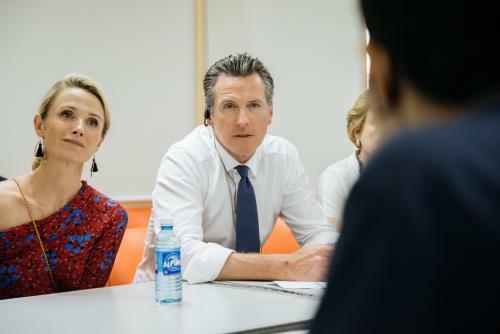 Governor Gavin Newsom, First Partner Jennifer Siebel Newsom and Assemblymember Wendy Carrillo meet with U.S. Ambassador to El Salvador Jean Manes. Photo credit: Eduardo Ezequiel. Governor Gavin Newsom visits La Chacra migrant reintegration center and speaks with recently deported Salvadorans. Photo credit: Eduardo Ezequiel. 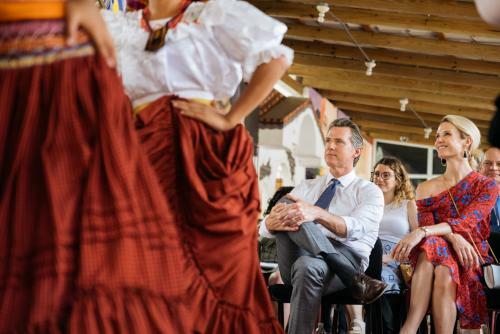 Governor Gavin Newsom, First Partner Jennifer Siebel Newsom and Assemblymember Wendy Carrillo are welcomed to Panchimalco with traditional Salvadoran dances and cultural presentations. Photo credit: Eduardo Ezequiel. Governor Gavin Newsom, First Partner Jennifer Siebel Newsom and Assemblymember Wendy Carrillo hear from international human rights organizations about the challenging conditions for women, children and members of the LGBTQ community, forcing many to migrate​​. Photo credit: Eduardo Ezequiel. The California Department of Social Services (CDSS) administers grants to qualified nonprofits for the provision of qualified and culturally competent immigration services to low-income immigrant Californians. Assemblymembers Miguel Santiago and Wendy Carrillo advocated for funding in the 2018-19 budget to support children in immigration proceedings and for current or past adult beneficiaries of TPS. The funding was made available for a period of three years with $5 million of this funding already granted to eligible nonprofits. The Governor announced that he will direct the remaining $5 million to be used to support immigrant children and immigrants applying for humanitarian protections in California. This funding will support the post-placement needs of immigrant families in California that have recently reunited with their children or have accepted placement of an unaccompanied child. This action will also strengthen California’s legal investments for humanitarian supports by funding mental health evaluations and the navigation of humanitarian relief such as special visas for victims of crimes (i.e., U visas, T visas and VAWA). California is home to a significant number of Dreamers, TPS holders and DED recipients who, in many cases, have lived in the state for most of their lives. President Trump has taken steps to end Deferred Action for Childhood Arrivals (DACA) and take away TPS and DED protections for individuals covered by those humanitarian programs. H.R. 6, the Dream and Promise Act authored by Rep. Lucille Roybal Allard, provides an opportunity for permanent status and a pathway to citizenship for Dreamers, TPS holders and Deferred Enforced Departure (DED) recipients. California is home to the largest population of Salvadorans outside of El Salvador – some 680,000. El Salvador’s rate of people driven from their homes due to violence and conflict – 3,600 out of every 100,000 inhabitants – is second only to Syria. In 2016, El Salvador was the second leading country of nationality, next to China, for persons granted defensive asylum in the United States. In his first weeks in office, Governor Newsom signed AB 72, legislation to fast-track state aid to asylum seekers who are being abandoned at bus stations and on the side of the road by the federal government. It was the first bill he signed into law. AB 72 established a Rapid Response Relief Fund of $5 million in immigration assistance, which helped support the opening of a migrant shelter for families in San Diego. 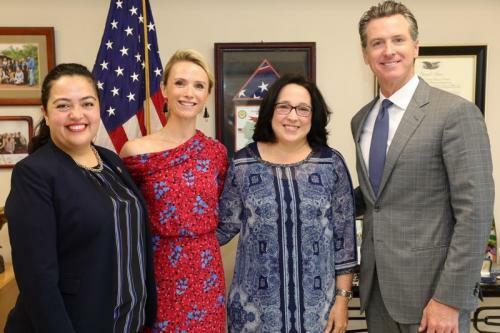 The Governor was joined in El Salvador by Assemblymember Wendy Carrillo, the only Salvadoran serving in the California Legislature, and First Partner Jennifer Siebel Newsom.